It is unlawful for children under or apparently under age 16 to be present (and unaccompanied as noted above) in any public place or a place of public entertainment in Saskatchewan between the hours of midnight and 6:00 a.m.
As with traffic stops, if you do not agree with the officer's conduct or actions, keep track of all pertinent information, including the officer's rank and badge number. 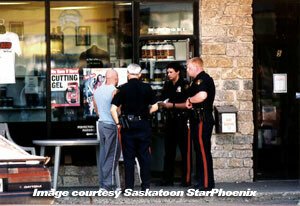 You have the right to complain at the Saskatoon Police Service. Officers are unable to handle your complaint on the scene.